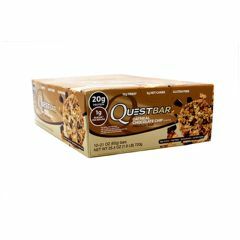 AllegroMedical.com presents The Quest Nutrition Quest Protein Bar - Oatmeal Chocolate Chip Protein Bar Gluten Free. Eating a Questbar says something about you. You're part of a community, striving for greatness, hungry for more, unwilling to comprise. Welcome to team Quest. Gluten Free. Protein Blend (Milk Protein Isolate, Whey Protein Isolate),Soluble Corn Fiber (Prebiotic Fiber), Almonds, Water, Pecans, Gluten Free Oats, Unsweetened Chocolate, Eruthritol, Natural Flavors, Cocoa Butter, Sea Salt, Cinnamon, Sucralose, Steviol Glycosides (Stevia).